Harpeggio Music was founded in 1998 by Stephanie Janowski and Heather Paschoal, two alumnae of the renowned Schlomovitz-Quinn Harp Studio of Palo Alto, California. Since then, we have grown to include three additional affiliated teachers, and a total of nearly 50 students from Los Gatos and San Jose in the south, to San Francisco and Sonoma County in the north, as well as several from the East Bay. Together, we hold harp recitals, master classes, workshops, theory classes, guest harpist performances, and our flagship event - the annual Harps for the Holidays concert. Our goal is to share our love of music and of the harp, both through teaching and through performance. 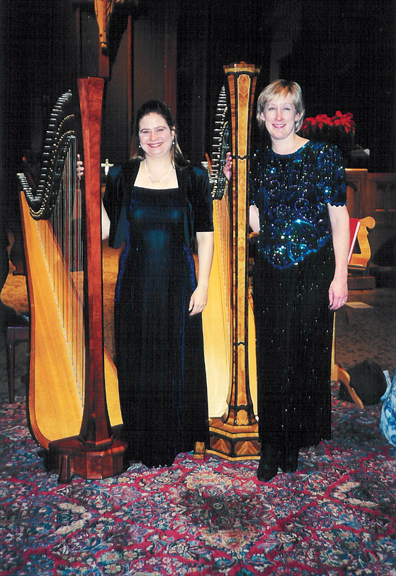 Stephanie and Heather are both very active professional harpists, playing throughout the San Francisco Bay Area for weddings, receptions, parties, dinners, and other special occasions. We have played regularly for such events as hotel brunches and teas, and we currently perform most weekends at a variety of venues. Find out more About Stephanie and About Heather. For more information about having a harp at your event, see Weddings & Events. For more information about harp lessons, see Harp Lessons.